Not revealing everything about your past life may or may not affect your married life or job prospect. However, being secretive and shy about your physical and financial health while consulting a doctor or a financial planner, will affect your daily life for sure. Visiting a financial planner, for the first time, is not something that is easily achieved. There are a lot of doubts, trepidations and second thoughts before one finally takes the plunge. What will the financial planner think if I told him that I am somewhat careless with money, or if I told him that I manage to save next to nothing out of my monthly income? Perhaps the thought of discussing this with a rank outsider would make one feel embarrassed. Financial planners, like doctors know that their client might initially be hesitant to reveal much of their unshared secrets about financial and physical health. Their professional training helps them to put the client at ease and encourage them to share information, which might be of help for a healthy future. 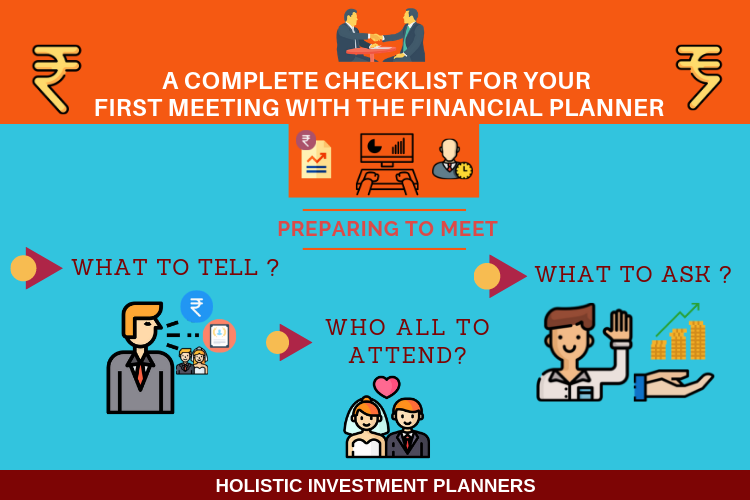 In order to successfully launch into the first visit to a financial planners, here are a few tips, which will ensure that the meeting is successful. More often than not a specific stimulus like impending retirement, children’s higher education, marriage or divorce prompts someone to seek professional help from a financial planner. sources, savings and immediate as well as long-term goals. b. The specific financial requirement that you are certain about or anticipate will happen in the next 6 months or one year. c. The major financial commitments done in the recent past that can have an impact on your long term financial plans. d. Your financial requirement time-plan; this will include things like- number of years before you will need to fund your child’s higher education or marriage, or years to your retirement, if a major medical expense is anticipated on a regular basis in the near future etc. The financial planner would like to know as much as possible with regards to the task at hand. This will help him to come up with the best possible advice for a healthy financial future. A financial planning consultancy meeting should ideally not be one sided. The client has the right to ask questions and this they should do in order to have a clear idea of what to expect from this meeting and necessary future association. a. What is their background? Do they have a specific area of specialization? b. What are their minimums – are there minimum requirements for Assets Under Management (AUM)? What is their fee schedule and structure? Is it per meeting basis or per hour basis? c. Do they retain the services of other professionals in their network? Do they have tie-ups with attorneys, accountants, or insurance specialists; should requirement for such services arise? d. Are you expected to invest in their investment models? Are you expected to transfer your assets to them? e. What responsibilities and obligations does the consultant have towards their clients? f. How is this association going to move forward? Face-to-face interactions or chats over the Internet? How frequently are the meetings or chats going to happen? For a married couple it always helps to go on a joint visit to the financial planner, at least on the first instance. Together they can discuss and decide the way forward. Whether the relationship with the financial planner is worthy of being pursued in the long run; whether the financial planner can be trusted and if he actually understands the needs, and seems capable of delivering the results. At the conclusion of the first visit, the financial planner should be able to clarify the kind of services he can provide and the solutions he can propose. He will also provide an estimate of his costs and professional fees. The couple may return home and discuss the meeting and its inputs before moving on to the next session with the adviser. Usually it takes between two to three meetings before an agreement is formalized. There might be bouts of trepidation and chunks of uncertainty looming over the decision to engage a financial consultant. However, moving beyond this phase of doubt will yield good results.A professional financial adviser is sure to prescribe measures that will boost financial health in the long run. Next Next post: How to validate the Underperformance of a Mutual Fund?